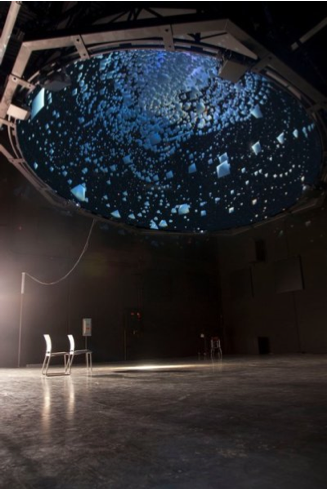 On March 16, 2011 UNM ARTSlab, Santa Fe Complex (sf_x) and the Institute of American Indian Arts (IAIA) shared our NSF PFI fulldome research at the Digital Dome @ IAIA in Santa Fe, New Mexico. The event was sf_x’s WedTech, a weekly semi formal presentation that usually occurs at the Santa Fe Complex. Excepts of our annual report along with images from this public presentation are below. Dr. Joe Kniss led a team of graduate students (Jeff Bowles, Matthew Dosanjh, Vahid Normoofidi, Andrei Buium) to develop an OpenGL software platform that would allow real-time rendering on curved surfaces. The basic idea of the software was to take a typical OpenGL application and intercept the rendering code to render to an off-screen buffer instead of the screen, as it would normally render. This off-screen buffer was then distorted by virtually mapping it to a spherical structure on the graphics hardware, which was used by the GPU to compute what each projector in the dome should display in order for the dome visualization to appear correct to a user standing in the center of the dome. The result was a framework that allowed us to run real-time rendering applications in dome environments without distortion, and all one needed to do was to modify the existing code to have this new rendering path. The project, called DomeGL, was a success and it enabled the students to port several applications to the dome quickly and easily. One of the drawbacks of digital fulldomes as raised in the brainstorming workshop is that they can be expensive and not many people have access to this technology. To this end, the teams from SF Complex and ARTS Lab worked on low-cost, portable dome solutions that would enable more people to experience dome technology. The Santa Fe Complex (in association with Joe Abraham Dean from Lumenscape) worked on a cloth- based dome that could be easily transported and set up in about a day (Fig. 3). This portable dome has market potential since it allows users to set up dome environments at a relatively small cost. A cloth dome designed and built at the Santa Fe Complex. 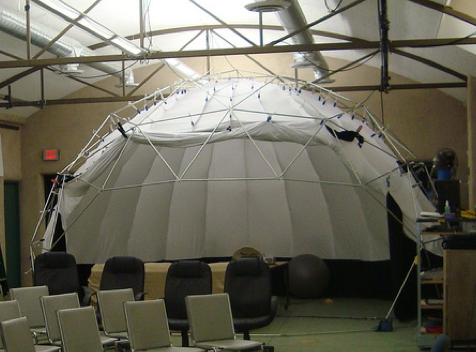 The fabric and structure is very lightweight, making the dome very portable for deployment in remote venues. This allows people who normally would not have access to a full dome to experience full dome content. Complex (Stephen Guerin working with Cody Smith, Steve Smith, Bjørn Swenson, August Swanson, Skyler Swanson, Scott Wittenberg). 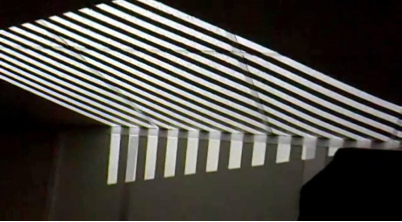 Binary code patterns projected onto the corner of a room. Each pixel in each picture represents either a 0 or 1 in the camera-to-projector map. Dr. Joe Kniss (AGL) demonstrates the skateboard interface that he built along with a set of graduate students and the ARTS Lab team. 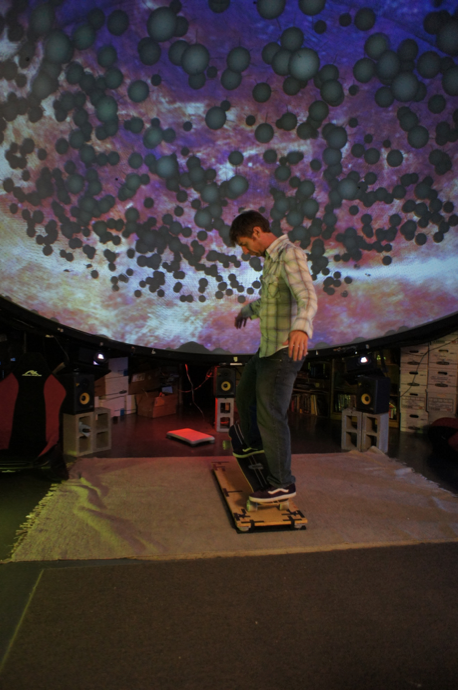 The skateboard interface allows more intuitive navigation of immersive environments. 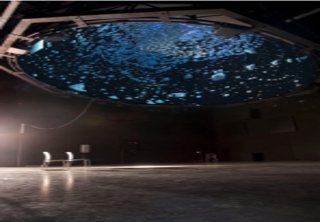 The teams from IAIA and ARTS Lab have built and set up a digital fulldome at IAIA, which is now in operation and being used to train the next generation of dome users how to work with this new technology. The ARTSLab team is offering a course focusing exclusively on immersive media and interactive visualization. The purpose of this course is to teach students at UNM about the exciting applications that are being enabled through fulldome technology, and the students have the opportunity to put together dome content themselves as part of the course. A wide-angle picture of the IAIA dome suspended in the air. The IAIA dome is designed to be rotated and lifted up and down, which allows it to be used in a wide variety of configurations and for a wide range of immersive applications.